The Aklavik Trapper's Rendezvous is a community festival that is held annually over Easter weekend. The festival includes: dog and snowmobile racing, community feasts, drum dancing, fun games, cultural events and much more. Aklavik community members and all those from near and far are welcomed each year to celebrate Inuvialuit culture and tradition. Feel free to check our Events Calendar for upcoming Mad Trapper events. Shingle Point is the name of an approximately seven-mile long gravel spit that stretches off of the Yukon's Arctic Coast a few miles east of the border with the Northwest Territories. Shingle Point is a much loved whaling and fishing site for many Inuvialuit who live in and around Aklavik and Inuvik. The Inuvialuit and Gwich'in have been whale hunters since they have been in existence. Bowhead whales, a member of the right whale family, are found in the Beaufort Sea, in Baffin Bay and few inhabit the Hudson Bay. Bowheads have been scarcely hunted in recent times, largely because of their huge size and in part because they were almost eradicated by commercial American whalers a century ago. Hunts for the bowhead, the largest Arctic sea mammal, were not long ago only fond memories for Inuvialuit elders. Recently, a number of Aklavik hunters decided to revive this traditional practice. •	The hunt helps to preserve culture and provide food for their people through sustainable harvesting and conventional sharing. In 1979, Canada prohibited the killing of all right whales without a license. Canada withdrew from the International Whaling Commission in 1982 and replaced the Whaling Convention Act with the Cetacean Protection Act (Cetacean is the scientific term for whales). This new act allows the Canadian Minister of Fisheries to distribute licences for Aboriginal people to hunt whales. Despite protests from the American government and numerous animal rights activists, the Canadian government issued a bowhead whale license to the hunters of Aklavik in August of 1991. The bowheads are hunted in the native settlement regions, namely Shingle Point, where one whale can be harvested annually. This restored a proud custom for the community and marked a defining moment where culture and traditions were finally reinstated. Shingle Point will continually have great meaning among the Inuvialuit and Gwich'in communities. During the first half of the 20th century, peoples from the Aklavik region were very reliant on the booming fur trade; specifically, the excellent muskrat trapping on the Mackenzie Delta. Aklavik is well positioned; it sits within the low-lying, roundabout maze of the Mackenzie delta, one the richest fur areas in Canada. 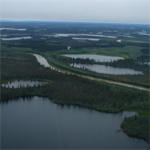 The Mackenzie River flows northward from Great Slave Lake into the Beaufort Sea of the Arctic Ocean. Its basin, with an area of 1,805,200 sq km, is the largest in Canada. The entire system is 4,241 km long, making it the second longest river in North America. The Mackenzie River was discovered in 1789 by explorer Alexander Mackenzie. The Mackenzie River delta begins at Point Separation. The average annual emission of Mackenzie water into the delta is 340,000 cubic feet per second, increasing to an average of 540,000 cubic feet per second during the summer months. The delta covers about 4,700 square miles and is a maze of branching, entangled channels, numerous cutoff lakes and ponds. These lakes are an excellent habitat for muskrat, and the trapping of these animals became the main source of income for the Inuvialuit inhabitants of the delta between 1920 and 1960. The large delta of the Mackenzie River provides habitat for migrating Snow Geese, Tundra Swans, and Brant and is a breeding habitat for various other waterfowl. The delta is also a birthing area for Beluga whales. The whole region is subject to a harsh winter climate, and its resources are fewer and less accessible than those of southern Canada. Even so, it is one of the few great well-preserved areas of the world, offering a diverse wildlife and impressive scenery. The Mackenzie River delta is home to few large animals but a huge population of muskrat and mink. Consequently, it is a deprived site for hunters yet a prosperous one for trappers. Aklavik was once considered the muskrat fur capital of the world. Hundreds of thousands of muskrats were trapped, as many as 250,000 in some years. By the 1930s, Aklavik was one of the most important fur-trade centers in Canada. 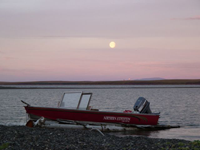 The Mackenzie River is also of great importance as it deposits enormous quantities of driftwood on western Arctic beaches, giving the Inuvialuit far easier access to wood than most other Canadian Inuit. The recovered wood is invaluable to the people of Aklavik, as it is used to make tools, to build houses, sleds and boats. Alunik, Kolausok & Morrison. (2003). Across time and tundra: the Inuvialuit of the western arctic. Vancouver: Raincoast Books.